The Coast Guard Reserve offers citizens the opportunity to serve on a part-time basis, while still serving their country and community. Reservists take part in maritime safety, mobility, security, national defense and the protection of natural resources. Coast Guard reservists spend an average of one weekend a month and two weeks a year performing duties vital to our nation's security. Service members share their views on the Coast Guard. Petty Officer 2nd Class Vanessa Valdes: I am a reservist at United States Southern Command. I’m an intelligence specialist, second class, and on my personal time, I’m a full-time student at Broward College, studying criminal justice. Seaman Deirdre Gray: My job right now is a Seaman on the Healy. Our main objective and mission is to assist the National Science Foundation in their science research of the Bering and the Arctic. Petty Officer 3rd Class Adrien Cheval: As an individual, I really enjoy getting underway. The fact that I’m getting paid to — to drive a boat and to save lives and to also enforce federal law is a great privilege. Seaman Deirdre Gray: You know, these are things that, outside of the Military, I don’t think I would have had the — ever had the experience to see or do. Petty Officer 3rd Class Adrien Cheval: The Coast Guard’s also a humanitarian agency, in the sense that we — we provide assistance to Americans and others in distress, here and abroad. For example, in 2005, we conducted search and rescue operations during Hurricane Katrina. Petty Officer 2nd Class Vanessa Valdes: I think my passion for the ocean drove me to join the Coast Guard. Whether it be boating or, you know, under-the-surface scuba diving, but just everything about it. It’s pretty much my life. Petty Officer 3rd Class Adrien Cheval: I chose the Coast Guard for a particular reason, and I knew what I was getting myself into. And today, I’m very happy that I made that decision. Petty Officer 2nd Class Vanessa Valdes: What makes me the most proud is seeing my mom’s face light up when I tell her, you know, about my day, and looking at the pictures of all my experiences and just thinking back. It’s like, “Wow, I was there, I did this, I did that.” You know, none of that would have been possible without the Coast Guard. To join the Coast Guard Reserve, you must be a U.S. citizen or resident alien between 18 and 39 years old (17 with parental consent). While GEDs are sometimes accepted, high school diplomas are preferred. All recruits take the Armed Services Vocational Aptitude Battery test to determine placement. Coast Guard reservists undergo Basic Training at the Coast Guard Training Center in Cape May, New Jersey, for eight weeks. Reservists also train one weekend per month and two weeks every summer. The Coast Guard Reserve relies on all kinds of skills — including some you may already have. 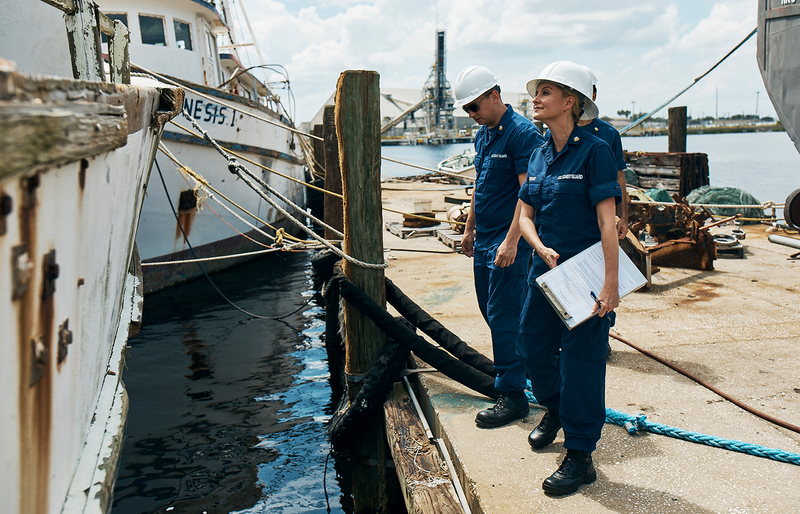 Whether you fill a position similar to your civilian job or learn a new professional career skill, the Coast Guard Reserve will make you better trained and more employable for the future. Interested in full-time service? Take a look at the Coast Guard. Members of the Coast Guard Reserve are paid for all time spent training or deployed. In addition, they receive most of the same employment benefits as full-time Coast Guard members, including tuition support, training and plenty of time on the water. Combining travel, career training and strength of character, it’s easy to see why the Coast Guard can be so rewarding.